US, 1951, 77 minutes, Colour. Clark Gable, Ricardo Montalban, John Hodiak, Adolphe Menjou, Maria Elena Marques, J. Carroll Naish, Jack Holt, Alan Napier. 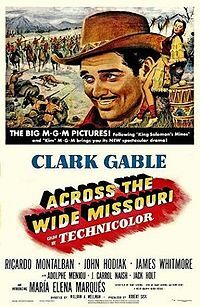 Across the Wide Missouri is an interesting western, the clash between whites and Indians. Commentators note its brevity of running time and suggest that it may have been planned as a bigger film. It was directed by William Wellman, veteran director of many westerns (Westward the Women) and many air adventures (from Wings to Island In The Sky, The High And The Mighty). The film is also a star vehicle for Clark Gable and he is supported by MGM company actors of the early '50s. The film is sympathetic towards the Indians (a trend initiated by Delmer Daves' Broken Arrow in 1950). 1. Interesting and enjoyable western? The American heritage? Whites and Indians? 2. Location photography, colour locations? The wag of life of the Indians? Of the West? Battle sequences? 3. The title and its focus, the frontiers, the clashes between whites and Indians? 4. The West of the 1820s: the trappers, the interaction with the Indians, the Indian tribes and their way of life, hunters? The exploitive whites? The rebellious Indians? Clashes and battles? 5. Clark Gable as Flint Mitchell:. a trapper, his work, friends, encounter with Kamiha, the marriage for permission to hunt in Indian territory, his love for his wife? The stockade, the trapper's work? The friendship of the Chief, the clash with Ironshirt? The death of the Chief? Vengeance motives because of Ironshirt killing white men? The clash with Ironshirt, the death of Kaniha? Mitchell's clash with Ironshirt? Staying with the Indians to bring up his son? A Clark Gable hero? 6. Kamiha and the Indian lifestyle, her marriage, the birth of her son, her death? 7. The Indians: the Chief and his sympathy, Bear Ghost and his other advisers? The contrast with the younger generation, Ironshirt and his hostilities; they clash with the Chief, his death, the hunters leaving the territory and the ambush, the death	of Kamiha? The clash between Mitchell and Ironshirt? 8. The sketch of Mitchell's associates: Brechane, Pierre? The military authorities? 9. Familiar themes of the West but presented colourfully and with sympathy to the Indians?